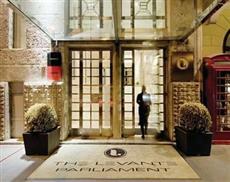 The Levante Parliament is a member of Design Hotels. Situated in the heart of Vienna The Levante Parliament offers a uniquely inspiring environment, combining contemporary architectural modernism. The Levante Parliament offers 65 rooms and 5 Junior Suites. Most rooms are situated towards the courtyard, offering a very rare luxury in Viennas metropolitan bustle. Even with the windows you will find yourself in complete quiet surrounding. Have your welcome quality drink and settle in the total comfort of modern interior design that combines high quality wood, stone and glass with indirect lighting to create a uniquely relaxing atmosphere. All rooms offer everything from flat screen TV and complimentary high speed internet connection to individual controllable air condition and 24h room service. Limousine transfers can be arranged upon request. Glass artist Ioan Nemtoi created the breathtaking ambience of Nemtoi Restaurant-Bar with its unique glass bar and four walls of glass fire. The cuisine team lures gourmets with fantastic creations and treats patrons to grates wines to round off their culinary journey.